aFrom the Department of Radiology, University of New Mexico, Albuquerque, New Mexico. SUMMARY: Infectious agents have been investigated, developed, and used by both governments and terrorist groups as weapons of mass destruction. CNS infections, though traditionally considered less often than respiratory diseases in this scenario, may be very important. Viruses responsible for encephalitides can be highly infectious in aerosol form. CNS involvement in anthrax is ominous but should change treatment. Brucellosis, plague, Q fever, and other bacteria can uncommonly manifest with meningoencephalitis and other findings. Emerging diseases may also pose threats. We review infectious agents of particular concern for purposes of biowarfare with respect to CNS manifestations and imaging features. God omnipotent is mustering in his clouds on our behalf armies of pestilence. Shakespeare had Richard II threaten his enemies with “armies of pestilence” from the clouds—a prospect that seems more plausible in our time when incidents involving anthrax, smallpox, and hemorrhagic fevers continue to make headlines. Many infectious agents have been developed during the past century for potential military use. By their nature, these are unconventional weapons more effective against unprotected, civilian targets than against soldiers; this attribute may make them attractive to terrorists. Among those organisms, some target the central nervous system. For others more commonly considered pulmonary or systemic agents, significant CNS effects may still result. Below, we review the historical background, some of the organisms considered at high risk for potential biowarfare or bioterrorism with a focus on neurologic implications, and potential future threats. Infections have accompanied warfare throughout history and have often caused more deaths than trauma.1 Occasional attempts were made to spread illness among enemies as a tool of warfare. One of the most notorious examples was giving blankets from smallpox victims to American Indians. Such effort, though reprehensible, in retrospect had limited impact in comparison with the widespread, natural impact of new diseases through the Americas. It is estimated that 95% of the American Indian population may have died as a result of exposure to smallpox, measles, and other European diseases.2 This demonstrates the potentially lethal effect of infectious diseases on an immunologically naïve population. The Cold War accelerated work by both the United States and the Union of Soviet Socialist Republics. The United States developed 5 infectious agents: anthrax, tularemia, brucellosis, Q fever, and Venezuelan equine encephalitis, in addition to toxins of biologic origin: botulinum and staphylococcal enterotoxin B. Information on the Union of Soviet Socialist Republics work is less available, but reportedly anthrax, plague, tularemia, glanders, brucellosis, smallpox, Venezuelan equine encephalitis, and Marburg virus were all weaponized.2,4 US research during the Korean War included tests on conscientious objectors in addition to animal experiments. Human exposures resulted in illness but no deaths.5 The United States announced a unilateral, complete end to all biologic weapons work in 1969, and all existing stocks were destroyed by 1973. Furthermore, it supported an international biologic weapons protocol, which has since been signed by 170 nations. A major limitation of this treaty, however, is the absence of any inspection or enforcement provision. A dramatic illustration of the dangers of such weapons came when anthrax was accidentally released from a Soviet military facility in Sverdlovsk in 1979.6⇓–8 At least 66 deaths resulted, perhaps many more. Clandestine development of biologic weapons by other nations remains a concern because these weapons of mass destruction are both cheaper and less technologically challenging to produce than nuclear weapons. Infections are also of concern as instruments of terrorism. Preparing and delivering such agents does require some technical expertise, but the potential is demonstrated by relatively recent history. The perpetrators of the sarin attack on the Japanese subway system in 1995 were found to have anthrax and Ebola cultures in their possession and had made earlier unsuccessful attempts at aerosolized anthrax attacks.9 Most notably, in October 2001, there was a domestic terrorist attack in the United States by anthrax sent through the mail.10,11 Twenty-two cases of anthrax resulted in 5 deaths. What Makes an Organism a Weapon? Not all organisms are easily grown. Viruses in particular vary considerably in ease of culture. For those nations that seek to develop these potential weapons of mass destruction, some “shelf life” is desirable. Hardy organisms or those that have a sporelike form have been especially sought. They Can Be Delivered to a Population. Aerial delivery, the most likely delivery mechanism, and dispersion may involve significant force, and not all organisms could survive. They Can Be Infective and Harmful. For most agents, infectivity involves entry via the respiratory system. “Weaponization” of these agents has involved preparing organisms or a medium to maximize the likelihood of causing infection. For example, anthrax spores in nature often clump together, resulting in a size too large to reach the alveoli. Laboratory-prepared, weaponized anthrax is designed to deliver individual spores that are small enough to reach the alveoli. Harmful agents may not be lethal. Lethal infections may have obvious advantages for military or terrorist purposes, but some infections, “incapacitating agents,” may be effective at tying up military resources or spreading panic among civilian populations. A limited list of infectious agents meets all or some of these criteria for use as a weapon. Some of these agents have occasional CNS effects, while others more specifically target the CNS. Most anthrax cases in the world, up to 95%, are cutaneous forms.13 The characteristic lesion is a painless, pruritic papule that develops a vesicle. Central necrosis results in a classic black eschar that gives the name to the disease, from the Greek for coal or charcoal. Although the lesions may be self-limiting, antibiotic treatment is recommended. Severe edema can infrequently result. Ingestion of contaminated meat results in gastrointestinal anthrax. Manifestations include ulcerations, edema, fever, abdominal pain, constipation or diarrhea, and ascites. An uncommon form is oropharyngeal anthrax. Although oropharyngeal is usually less serious than gastrointestinal anthrax, cervical edema and lymphadenopathy can cause respiratory distress and dysphagia. A new type of infection, injectional, was described as a result of an unusual outbreak of anthrax in Scotland, England, and Germany in 2009 and 2010 among heroin users.14,15,19 Soft-tissue infections were characterized by disproportionate edema, less pain than that seen in necrotizing fasciitis, and relative lack of prominence of fever. Among 119 cases (47 considered confirmed and 72 probable or possible), 14 deaths occurred. A smaller, similar outbreak occurred in 2012–2013 in heroin users in Europe.16 It is suspected that heroin may have been contaminated during transportation to Western Europe. Meningitis may occur as a complication of any of these forms, most likely from hematogenous spread.12,20 Anthrax meningitis is usually fatal. 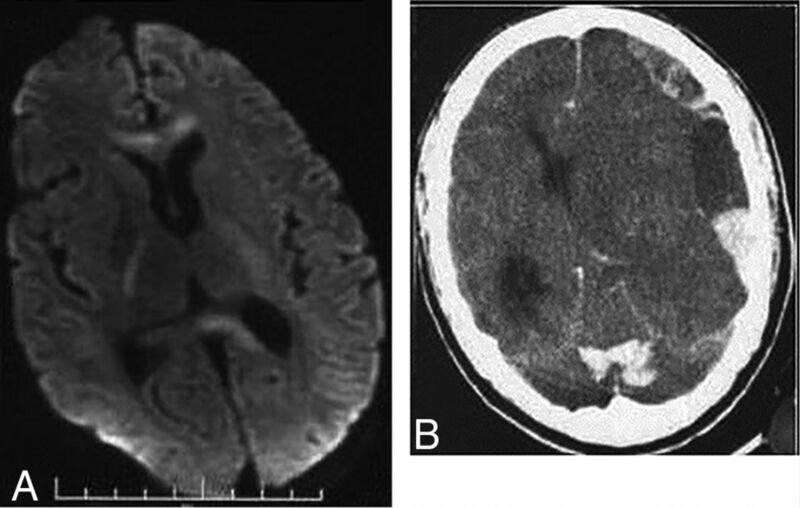 CSF may contain large amounts of blood and organisms, and pathologic postmortem examination shows hemorrhagic meningitis, severe edema, and inflammatory infiltrates.7,12 The few reports of imaging describe subarachnoid hemorrhage and leptomeningeal enhancement on CT and MR imaging and sometimes intraventricular and parenchymal hemorrhage (Fig 1).21,22 Leptomeningeal enhancement helps distinguish meningitis from other causes of subarachnoid hemorrhage. Although anthrax meningitis has been described as rare in naturally acquired cases, examination of the 3 large outbreaks mentioned above reveals a different picture. Years after the Sverdlovsk outbreak, results of postmortem examinations were published. Half of the 42 reported cases had hemorrhagic meningitis.7 One of the 5 patients who died in the US mail bioterrorism attack had hemorrhagic meningitis.10,11 Of the 13 deaths in confirmed anthrax cases in the Scottish outbreak, 4 resulted from hemorrhagic meningitis.19,23 This 20%–50% rate of meningitis in fatal cases shows the ominous prognosis of anthrax meningitis and a higher rate in these outbreaks than reported in the past in sporadic cases. Guidelines for the management of anthrax from a Centers for Disease Control and Prevention expert panel published in February 2014 make the presence or suspected presence of meningitis a key decision point in treatment.24 If meningitis is suspected, 3 drugs are recommended, including high–CNS-penetration drugs, and antitoxin therapy and steroids may be of benefit (though data are limited). Detection of hemorrhagic meningitis should thus trigger specific and aggressive treatment. Two of the major pestilences from the past are of concern as potential weapons of mass destruction. Smallpox, caused by the DNA virus Variola, was a cause of enormous devastation. Highly infectious, it caused approximately 30% mortality in unvaccinated subjects. The fact that humans are the only host made possible its elimination from nature by an unprecedented public health vaccination program.25 The only known remaining samples are held under tight security in strict laboratory conditions in the United States and Russia (though a forgotten sample was recently found in a laboratory freezer and quickly moved). That very success, however, means that much of the world now has little or no immunity against smallpox. The potential for terrorist or rogue state use of smallpox has led to contentious and continuing debate about the fate of the remaining laboratory stores, the course of research, and the appropriate timetable for destruction of those samples. Clinical manifestations of smallpox are primarily cutaneous and pulmonary, not neurologic. Brucellosis is caused by facultative intracellular bacteria of the Brucella genus, most commonly Brucella melitensis, which infects sheep, goats, cattle, swine, and dogs. Humans are infected by contact with infected animals or food, especially unpasteurized dairy products, but the disease is readily spread by aerosol, with a number of laboratory infections known.38,39 Brucella species were previously adapted for military biowarfare and are considered a possible bioterrorism agent. The reticuloendothelial system is the usual target, but granulomatous disease can occur in many organs. Clinical manifestations include acute febrile illness; chronic, undulant fevers; bone or joint disease in approximately one-third of patients, which can include spondylitis; genitourinary infections; hepatitis; lung infection; endocarditis, which, though rare, is responsible for most deaths; and neurologic disease in approximately 5%–10% of cases. Both peripheral and central nervous systems can be affected, and sensorineural hearing loss is common. Effective treatment of CNS disease requires months of triple drug therapy. CNS disease can be the first or predominant presentation.40 Imaging findings can be normal in many cases40,41; a review found 10 of 23 MR imaging studies with normal findings. Observed abnormal findings include the following: inflammation with dural, leptomeningeal, or lumbar nerve root enhancement, and suprasellar granuloma formation; white matter changes, focal or diffuse, likely due to demyelination; and vascular findings, lacunes, or small hemorrhages (Fig 2).41 Endocarditis may also lead to embolic disease or mycotic aneurysms. A number of viruses most known for causing encephalitis are considered potential tools for deliberate attack.42 Most viral encephalitides are arboviruses transmitted in nature by mosquitoes but are also transmissible by aerosolization, which would most likely be implemented by a bioweapon. Hemorrhagic fever viruses also are potential bioweapon agents. Many of these illnesses result in nonspecific imaging findings, and for others, there is limited information available on imaging findings. We review here some candidate viruses with notable imaging or clinical features; the list is not exhaustive. Japanese encephalitis. 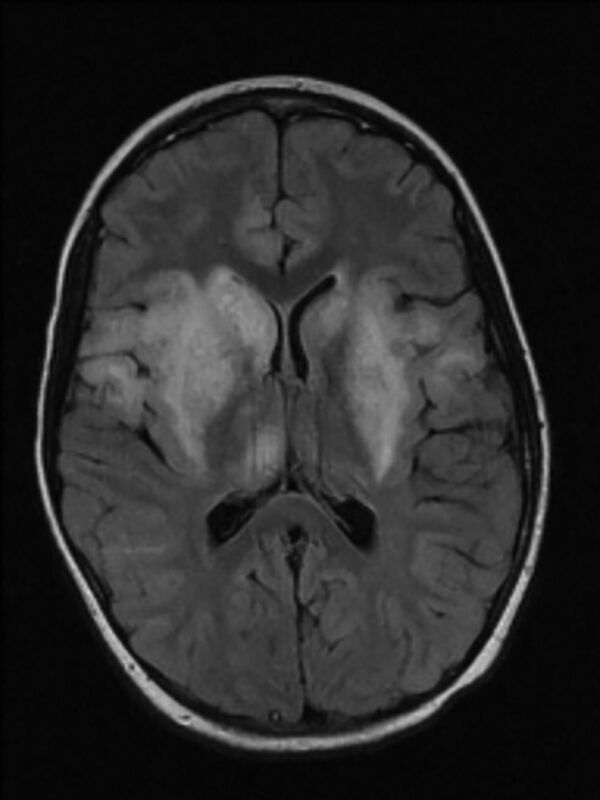 Axial T2-weighted MR imaging shows bilateral hyperintensity in the thalami and basal ganglia. Reprinted with permission from Kalita et al44 Copyright © 2003, American Medical Association. All rights reserved. Equine encephalitis viruses, of which there are 3 major types in the Western hemisphere, have been of special interest for biowarfare. These alphaviruses are fairly readily grown, highly infectious by aerosol (>100 accidental laboratory infections have occurred), and relatively stable.49 Venezuelan equine encephalitis was weaponized or investigated by several nations, including the United States and the Union of Soviet Socialist Republics. Venezuelan equine encephalitis results in a high rate of illness but a fairly low rate of encephalitis. There is relatively little information on imaging findings, to our knowledge. Most cases of Western encephalitis virus infection cause only mild symptoms. The development of frank encephalitis, however, as in any of the equine encephalitides, often causes major morbidity. 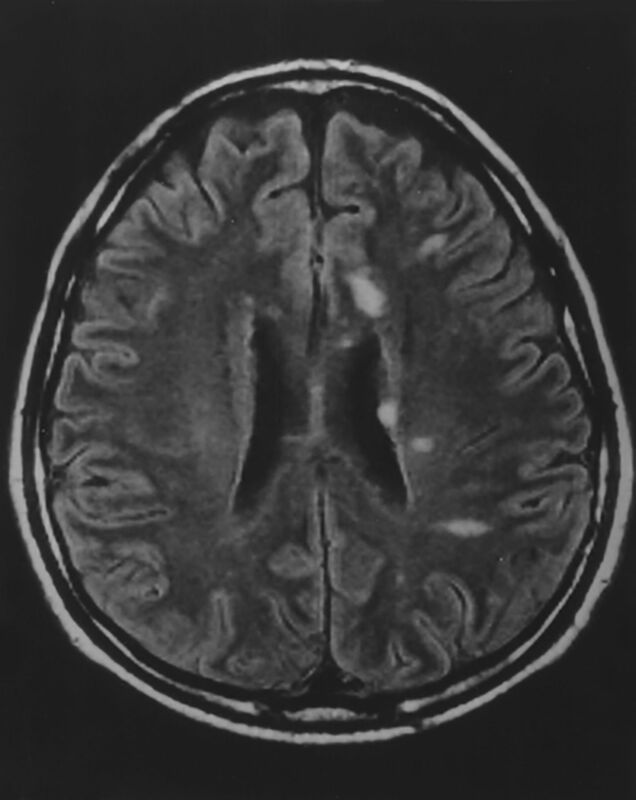 Eastern encephalitis has a lower symptomatic infection rate but more frequently causes clinical encephalitis, with an especially high case fatality rate (50%–75%).50 Eastern encephalitis also has more specific imaging features than most viral encephalitides. Most reports note early basal ganglia and thalamic involvement, which is a distinguishing feature from herpes simplex encephalitis (Fig 4).50⇓–52 In all of these equine viral encephalitides, the elderly and very young are affected most severely. Hemorrhagic fever viruses are RNA viruses that attack the vasculature. Increased blood permeability leads to hypovolemia and shock, with variations in specific organ involvement among the different viruses. For example, Rift Valley and yellow fever virus frequently cause hepatitis. Encephalitis has been reported as a rare complication of Rift Valley fever.18,53 Hemorrhagic complications are more common with the Filoviradae family. These include the Ebola virus, center of much attention and fear, and the Marburg virus, which was weaponized by the Union of Soviet Socialist Republics and also causes severe illness. Mortality rates from both viruses are in the range of 60%–90%. Information on imaging findings is sparse. Although often mild or asymptomatic, dengue virus can cause hemorrhagic fever. There have been controversial allegations regarding the use of dengue as a biowarfare agent. Dengue is a widespread problem, with an estimated 100 million cases of symptomatic infection annually. Also a flavivirus, it is endemic in tropical and subtropical countries. Infection can be asymptomatic but can also result in dengue fever, with fever, headache, abdominal pain, and muscle, bone and joint pain; dengue hemorrhagic fever, with thrombocytopenia, increased vascular permeability, and hemorrhagic complications; and dengue shock syndrome.54 Because of the sometimes severe hemorrhagic or metabolic complications, there is a variety of possible causes of dengue encephalopathy other than direct CNS infection. These include liver or renal damage, dehydration, and electrolyte imbalances. 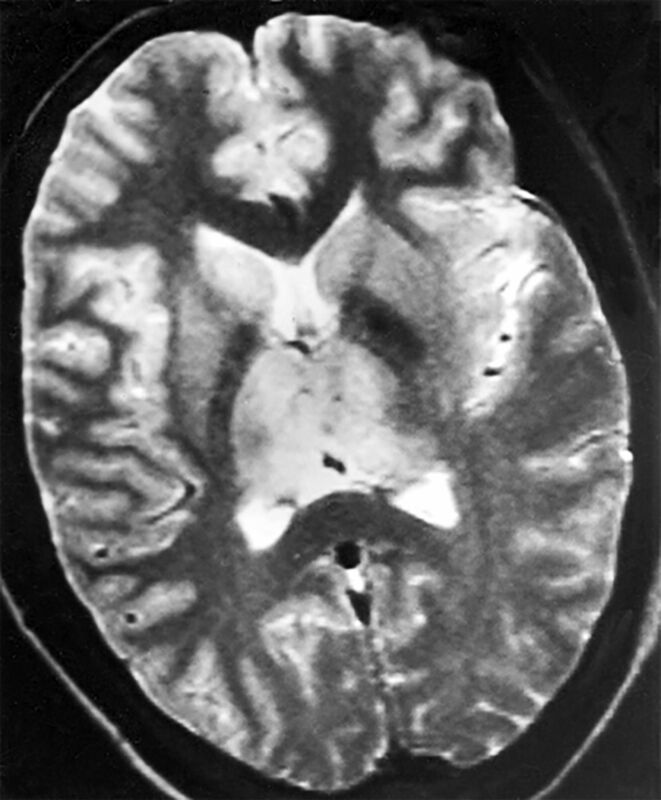 In addition, dengue viral encephalitis can occur, and separating secondary encephalopathy (in dengue hemorrhagic fever) from dengue viral encephalitis may be difficult.55 Imaging findings are nonspecific but include T2 hyperintensities in a variety of locations.55,56 Intracranial hemorrhage can be seen, and encephalopathy or shock may be accompanied by imaging findings of ischemic injury (Fig 5). Dengue. DWI (A) shows increased signal in the genu and splenium of the corpus callosum and posterior limbs of the internal capsules in a patient with dengue encephalopathy. Areas of edema or restricted diffusion in dengue encephalopathy are nonspecific and variable. Noncontrast CT of a different patient (B), with dengue shock syndrome, shows subdural and parenchymal hemorrhage. Intracranial hemorrhage is uncommon in dengue, even in those with systemic and cutaneous hemorrhagic complications. Reprinted from Bhoi et al55 with permission from Elsevier. New infectious disease threats are a constant possibility for a variety of reasons. New viruses are still being discovered, usually following an outbreak. Serious, frightening illnesses such as those due to coronaviruses bring extensive public concern. Pulmonary hantavirus came to attention in 1993 when multiple patients in the US Southwest presented with noncardiogenic pulmonary edema and respiratory failure, with high mortality. The responsible hantavirus was previously unrecognized. Other hantaviruses in Asia and Europe typically affect the kidneys. Mutations change the infectious nature of organisms. Influenza virus, for example, is particularly notorious for constant change. Influenza, though most commonly causing pulmonary disease, can sometimes have serious neurologic consequences. Nipah encephalitis, acute findings. Multiple discrete lesions on FLAIR are consistent with vasculitis reported on pathologic studies. Reprinted from Sarji et al60 with permission from the American Journal of Roentgenology. Armies of pestilence have been used for both military and terrorist purposes in the past and remain a threat. Several potential biowarfare infections cause abnormalities relevant to neuroimaging. Hemorrhagic meningitis should suggest anthrax. Although carrying a grim prognosis, hemorrhagic meningitis in anthrax should change treatment. Meningitis can also occur in several unusual diseases, including plague, Q fever, and tularemia, and is treatable with appropriate antibiotics. CNS findings in brucellosis are protean and can include inflammatory changes, demyelination, and vascular disease. Among the many different forms of viral encephalitis, Eastern equine and Japanese are notable for deep gray matter predilection. New or changed diseases remain a constant threat. In the appalling event of deliberate use, prompt recognition would be especially important. Disclosures: Blaine L. Hart—UNRELATED: Grants: National Institutes of Health grant: U54 NS065705. Loren Ketai—UNRELATED: Grants: National Institutes of Health grant: R01AT007171.
. Preventing proliferation of biological weapons: US assistance to the former Soviet states. Published April 10, 2002. http://oai.dtic.mil/oai/oai?verb=getRecord&metadataPrefix=html&identifier=ADA454722. Accessed August 1, 2014. PBS: American Experience. The Living Weapon. http://www.pbs.org/wgbh/americanexperience/features/transcript/weapon-transcript/. Accessed August 1, 2014. National Services Scotland on behalf of the National Anthrax Outbreak Control Team. An outbreak of anthrax among drug users in Scotland, December 2009 to December 2010. December 2011. http://www.documents.hps.scot.nhs.uk/giz/anthrax-outbreak/anthrax-outbreak-report-2011-12.pdf. Accessed April 2, 2014.
. Centers for Disease Control and Prevention expert panel meetings on prevention and treatment of anthrax in adults. Emerg Infect Dis 2014;20 doi: 10.3201/eid2002.130687.